Augmented reality is proving to be a useful tool for learning. A new app called Music Everywhere can teach you how to play the keyboard through AR—and it can be downloaded from the Microsoft Store for free. 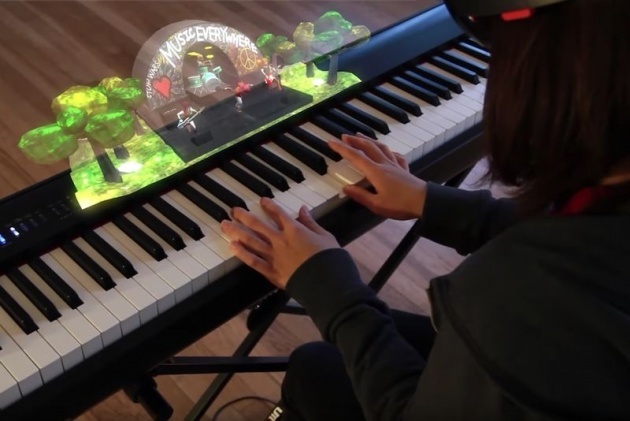 Co-founded at Carnegie Mellon’s ETC with Seth Glickman, Fu Yen Hsiao and Byunghwan Lee, the software provides such an effective solution for piano students that it won first prize in Microsoft’s HoloLens Developer Contest. Here’s how it works: Users must wear a AR headset, which will allow them to see instructions displayed right on the keys in front of them. Learning options include interactive theory lessons, live practice sessions, and animated demonstrations of blues, rock, jazz and classical styles. Part of Music Everywhere’s appeal is its affordability, compared to formal musical training. According to VR Scout, the team plans to make the product more accessible by partnering with Mira, a lightweight headset that retails for $200.